L-R: Jillian Vose (Beverage Director at The Dead Rabbit Grocery & Grog NYC), Beibhinn O Reilly (The Liquor Rooms, Dublin), The Rabbit, Linda O Rourke (MCM Spirits), Sean Muldoon (co-owner of The Dead Rabbit Grocery & Grog NYC). 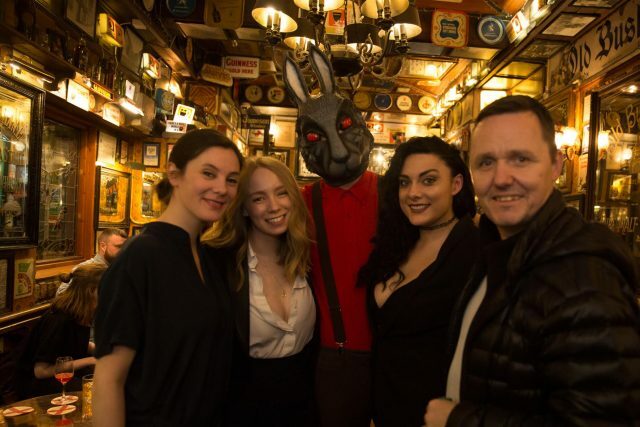 Meanwhile in Belfast, the Northern Irish duo behind the multi award-winning New York bar, The Dead Rabbit Grocery and Grog, launched the Dead Rabbit Irish Whiskey in their home town of Belfast on Thursday night at the Duke of York. Over 100 guests enjoyed a selection of Dead Rabbit Irish Whiskey cocktails, live music, whiskey toasts and red eye stares from The Rabbit.